A Simple Kinda Life: Giveaway: Wonderwash from Laundry Alternative! Introducing the Wonderwash from Laundry Alternative - the space saving, time saving, energy saving Green Clean solution for your laundry needs! As seen on The Rachael Ray Show, through a patented pressure system, the Wonderwash thoroughly cleans a five pound load in just minutes using less water and detergent than even hand washing! What can you wash with the Wonderwash? How about a week’s worth of dress shirts, 10 t-shirts, 30 pairs of socks, bibs, cloth diapers, burp clothes….the list goes on and on. How does the Wonderwash work? When you put warm or hot water into the drum, fit the lid in place and seal the machine,the air inside the drum will absorb the heat of the water and expand (i.e., just like a hot air balloon). When the air expands it creates pressure inside the drum. The pressure forces the detergent (which is diluted into the water) into & through the fabric (which is porous) about 100 times faster than you could by hand or machine. Tell Us How It Could Work for You – And Win a Wonderwash PLUS a Mini Countertop Spin Dryer, which quietly spins the water out of your clothes in just minutes. To participate follow these easy steps! 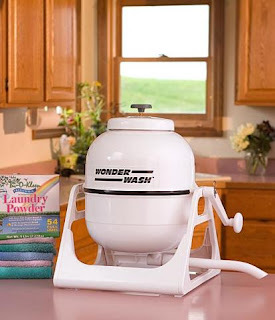 *Blog on your site about what YOU would use the Wonderwash and Mini Countertop Spin Dryer to clean. *Post a photo or a video of your mess and be sure to link back to Laundry Alternatives at www.laundry-alternative.com. Then join us on Twitter Friday, March 13th from 9:00 to 10:00 p.m. (EST) to tweet with Green Cleaning experts and find out who won the grand prize! Five attendees will also win The TrueGreen Laundry Washing Ball, which cleans your clothes without bleach or detergents in cold water. It does not contain harmful synthetic detergents, perfumes, dyes, or oils! Contest is open to all U.S. residents and runs from Friday, March 6th to Friday, March 13th at 8:00p.m. EST. All winners will be contacted within one week of closing to verify participation and obtain shipping information. Welcome to SITS!! You will love it here! Jodi Piccoult books are AWESOME!! I have read alot of her books, you will love her!! I also wanted to welcome you to SITS. wow, that is incredibly cool! stopping by from SITS to wish you a warm welcome. tomorrow is the spring fling, i hope that you stop by! Stopping by from SITS to say hello! !